This was a fun little card to make! I stamped the cute little snowman from My Creative Time's Snow Buddies on some white cardstock and then stamped him again on some Inkadinkado masking paper. Once I'd put the mask on him and made a little hand cut snow bank mask, I inked up the background with Tim Holtz distress ink in Tumbled Glass. I then removed the masks, colored the snowman parts with Copic markers, and stamped a sentiment from Snow Buddies. To make the card base, I welded together two 4 1/4" rounded squares in Silhouette Studio. I made the frame by welding a 4" and a 2.8" rounded square. The cute little button heart was made with MCT's Stitched Button Dies. I haven't used the My Creative Time And Then Some stamp and die set for a while, and I just love that giant ampersand die. 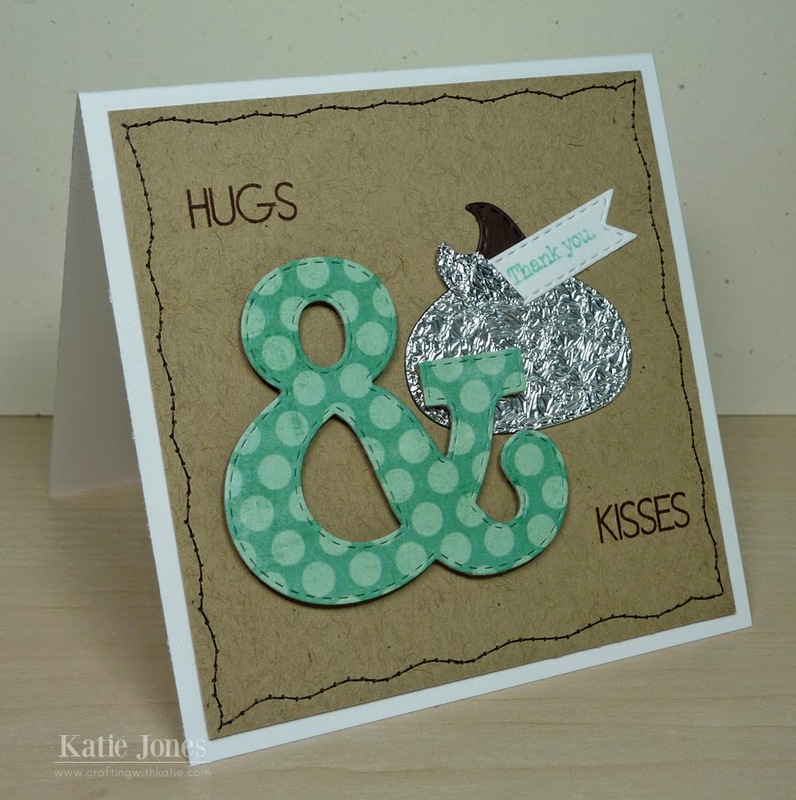 I thought it would be cute with the coordinating "hugs" and "kisses" stamps, paired with the kiss die from Chocolate Greetings. To make my kiss look realistic I cut it once out of dark chocolate cardstock and again out of some tinfoil that I had crumpled up and then smoothed out before running in it through my Vagabond with the die. The "thank you" sentiment is from the Once Upon a Time stamp set. A little sewing on the kraft layer finished off this 4 1/4" square card! Welding with Cricut Design Space - VIDEO! It's been almost a year, but I FINALLY made another video! Last week I made a card in which I'd welded some borders from Cricut's Elegant Edges to a rectangle to create my card base in Cricut Design Space, and I had some questions on how I did that. I made a video showing how with this card. I used one of My Creative Time's Stitched Rectangular Frame Dies for my cream layer (I also show in the video how to make the rectangle not as tall, so as to fit my card), and a sentiment from MCT's All You Need is Coffee. 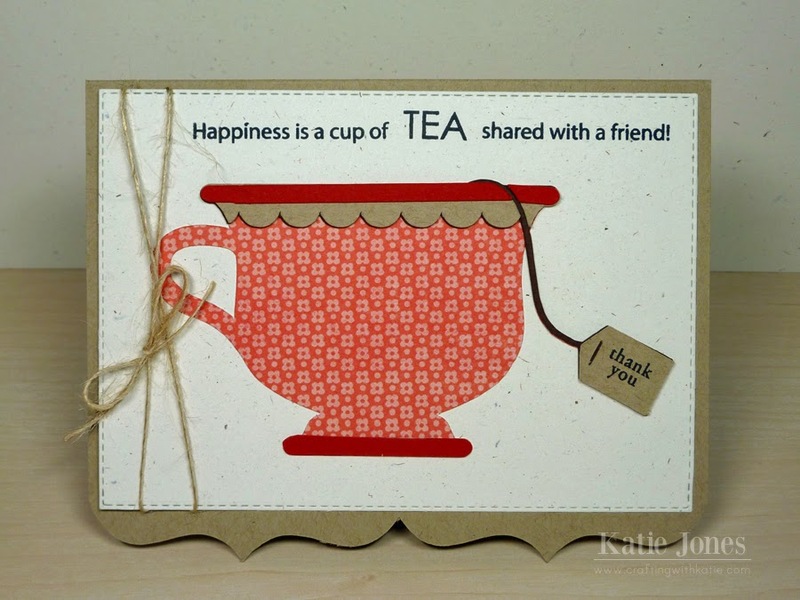 The cute teacup is from Cricut's Love You a Latte cartridge. Oh, and the patterned paper I used is from a really old My Mind's Eye pack, Life of the Party (one of my favorites). Last Christmas I received Papertrey Ink's City Scene stamps and dies as a gift, and I've made several cards with it, but I just got the chance to use it to make Christmas cards this year. 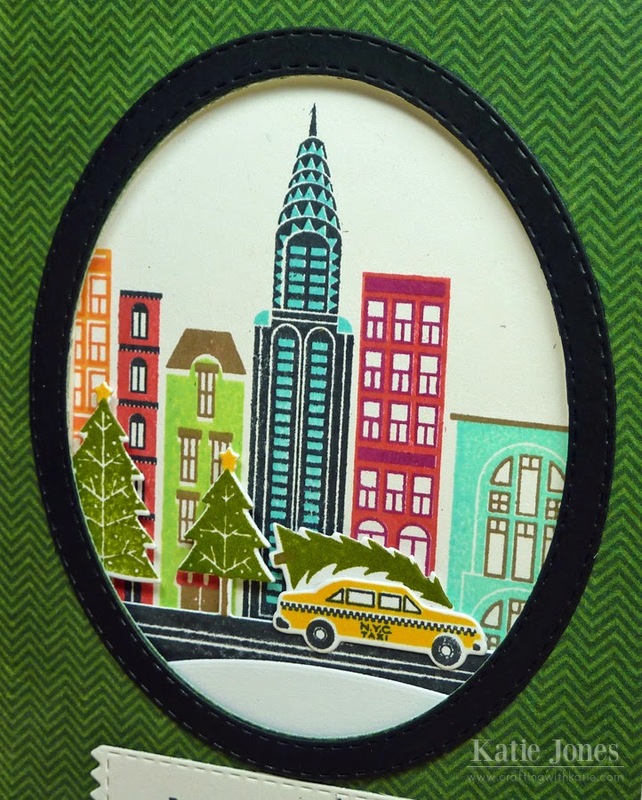 It has the cutest stamps and dies to create a NY city taxi cab with a Christmas tree on top, so it was perfect for a card for a coworker who is a New Yorker! For my sentiment, I used one from PTI's Holiday Lights stamp set, stamping it onto a die cut made with a die from My Creative Time's Just Simply Live. 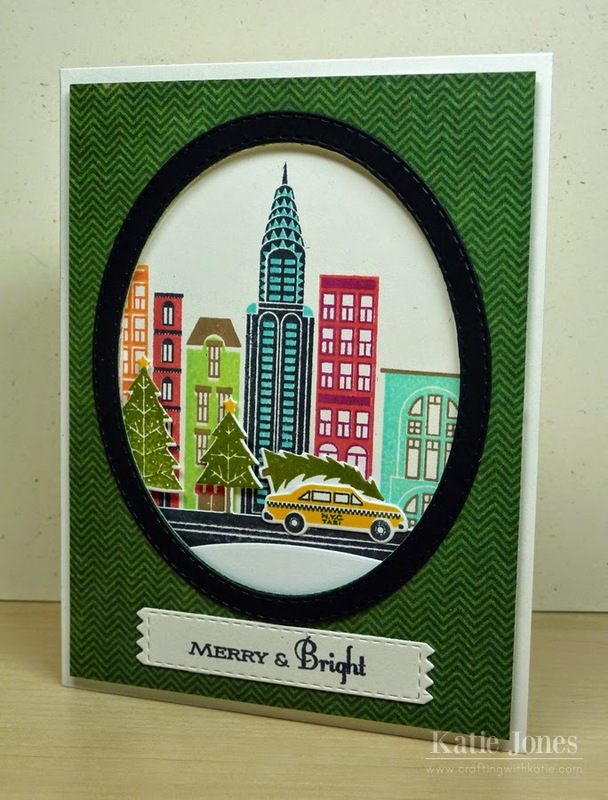 I used two of the oval dies from MCT's Scalloped Stitched Oval Dies to make a little window and then created my scene using lots of Hero Arts inks. The whole scene was created with stamps and dies from City Scene, except for the snow bank, which I made with MCT's Fun Stitched Edges Dies. Ugly Sweater - Cozy Wishes! First Project with Cricut Explore!